Huawei today announced it flagship series for the year, the Mate 20 and Mate 20 Pro. The phones share a number of features, but have their own identity thanks to differences in the screen and chassis. The most distinctive feature is the camera module on the rear, which is square-shaped and contains three cameras and the LED flash. 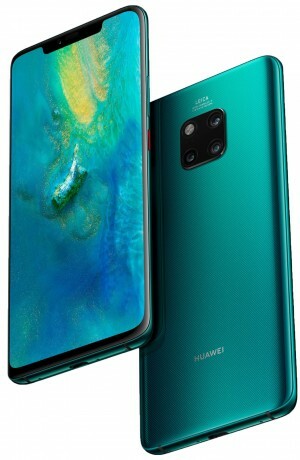 Both the Mate 20 and Mate 20 Pro are powered by Huawei’s Kirin 980 processor, which it says delivers even more AI-based smarts than its last-generation chip. The Kirin 980 features dual neural processing units to improve image recognition, Master AI for processing 1,500 different scenes, and predictive focus for tracking subjects in real time. Other shared features include Cat 21 LTE with dual SIM cards, Bluetooth 5.0, WiFi, GPS, and support for 256 GB memory cards. Both include a 24-megapixel selfie camera at f/2.4, and come in five colors, including green, blue, twilight, pink gold, and black. The devices run Android 9 Pie with Huawei's EMUI 9.0 skin on top. EMUI 9.0 is pared back a bit when compared to EMIO 8.0, and features business software as well as the ability to project a desktop mode to wireless displays. Mate 20 Pro: The Mate 20 Pro is the higher-end version of the two phones. It boasts a notched 6.39-inch curved OLED display with quad HD+ resolution and support for HDR. The Mate 20 Pro includes a fingerprint reader buried under the display, as well as 3D facial recognition for security. The phone features three rear cameras contained in a square module on the rear. The main camera has a 40-megapixel sensor at f/1.8, and it is joined by an ultra wide-angle 20-megapixel sensor at f/2.2, and an 8-megapixel 3x telephoto sensor at f/2.0. The phone supports wireless charging and can even act as a charger for other devices. The battery is rated at 4,200mAh. It comes with 6 GB of RAM and 128 GB of storage. Mate 20: This device has a "teardrop" notched screen that measures 6.53 inches across the diagonal with full HD+ resolution. The Mate 20 also features a three-camera array on the back with a main sensor of 12 megapixels at f/1.8, a wide-angle sensor of 16-megapixel at f/2.2, and an 8-megapixel 2x telephoto sensor at f/2.4. The phone supports wireless charging and the battery is rated at 4000mAh. It comes with either 4 or 6 GB of RAM and 128 GB of storage and a rear-mounted fingerprint reader for security. The Huawei Mate 20 and Mate 20 Pro are expected to ship starting today. The Mate 20 costs €799 and the Mate 20 Pro costs €1049. Huawei today announced the Mate 10 and Mate 10 Pro, the Chinese company's flagship smartphones heading into the end of the year. The Mate 10 (left) and Mate 10 Pro (right) are high-end devices with curved glass panels front and back, and a metal frame in between. Samsung today announced the Galaxy Note9, its premiere flagship phone for the year. The Note series has always featured Samsung's newest technology, a big screen, and a stylus. Samsung today announced the Galaxy S9 and S9+ phones, updates to last year's S8 models. The devices bear a striking resemblance to their predecessors and make only modest changes to the hardware. Motorola today announced four new affordable Android phones coming to the U.S. market before mid-year. Alcatel today announced its 3 Series smartphones, part of its larger family of new Android handsets. The 3 Series encompasses three phones that will offer screens measuring 5.5 inches (3), 5.7 inches (3X), and 6 inches (3V).